Expires 4 months after purchase. Limit 5 per person, may buy 10 additional as gifts. Book online at www.carchaseheroes.com/. For weekend bookings: Please enter “CCSUP1” code for one supercar weekend experience, “CCSUP2” code for two supercar weekend experiences or “CCSUP3” code for three supercar weekend experiences in the “Enter a Voucher Code” box and click “Go”. Alternatively for weekday bookings: Please enter “CCSUW1” code for one supercar weekday experience, “CCSUW2” code for two supercar weekday experiences or “CCSUW3” code for three supercar weekday experiences in the “Enter a Voucher Code” box and click “Go”. When your experience page is shown please select the track from the “Select Track” drop-down menu. Then select preferable date via the “Select Event” drop-down, then select preferable time and chosen car, and any additional miles or cars, payable directly to the merchant. Add personal details including full Groupon Security Code and click “Place Order Go” to complete booking. 7-day cancellation policy. Must be 10 or older. Min height is 135cm. Equipment provided. Must be fit to drive. Must sign waiver. Must wear comfortable flat shoes or trainers and long slim fit trousers. Subject to weather conditions and rescheduling in case of snow, ice, torrential rain, or fog. Insurance coverage up to £250.000 included. Liability insurance up to £10 million included. Customer liable for £5.000 excess fee if there is an accident. Customer can insure against liability for £25 per person extra on the day. Valid only for option purchased. Valid Mon-Sun 8.30am-3.30pm. £39 surcharge for 3 extra miles, £10 for passenger ride or sighting lap. 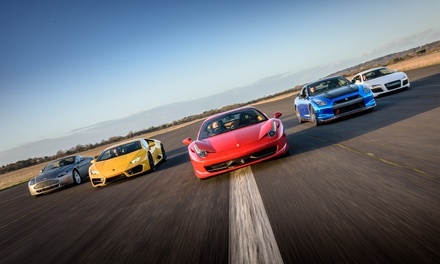 £20 surcharge for Huracan, Ferrari 458 Italia, and Shelby GT500. £25 surcharge for Dunsfold and Castle Combe tracks. £20 surcharge for Lydden and Dunsfold tracks. Please check website https://www.carchaseheroes.com/locations as locations can be subject to change. Verified using our merchant’s website on 24 May 2018.